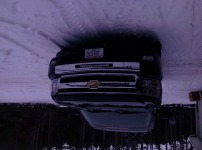 We had some fun one night and totally Lit' Up this Chev truck. With all the lights on it looks like a space ship coming in to land! HIDs in the Lo's, Hi's and Fog/Driving lights and a LED light bar in the bumper. Check it out. It is the most trick way to go and super stealth! We turned the Fog lights, Low Beams, and LED light bar for this picture! 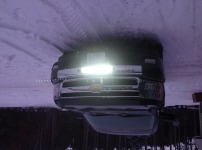 Just Xtreme LED Light Bar ON! 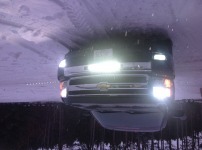 This is our new 20" LED Light Bar, Single Row unit. Here you can get a better picture of the front of the truck and the stock opening in the bumper where we put the LED light bar.